Manufactured from the late 1950s until the early 1990s (in variable-speed drive Mk. 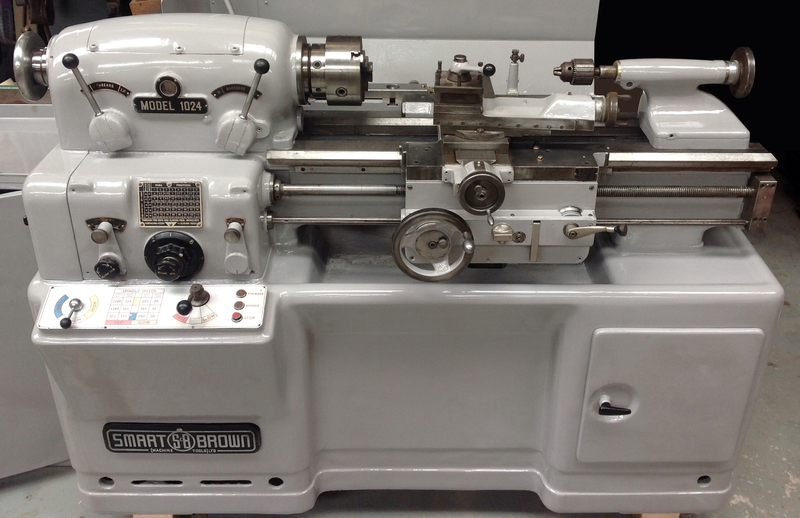 2 form) the Smart & Brown 1024 5.5" x 24" toolroom lathe was, and still is, a sought-after machine. It was manufactured to a very high standard - and not down to a price (which, as a result, was considerable). On the original Mk. 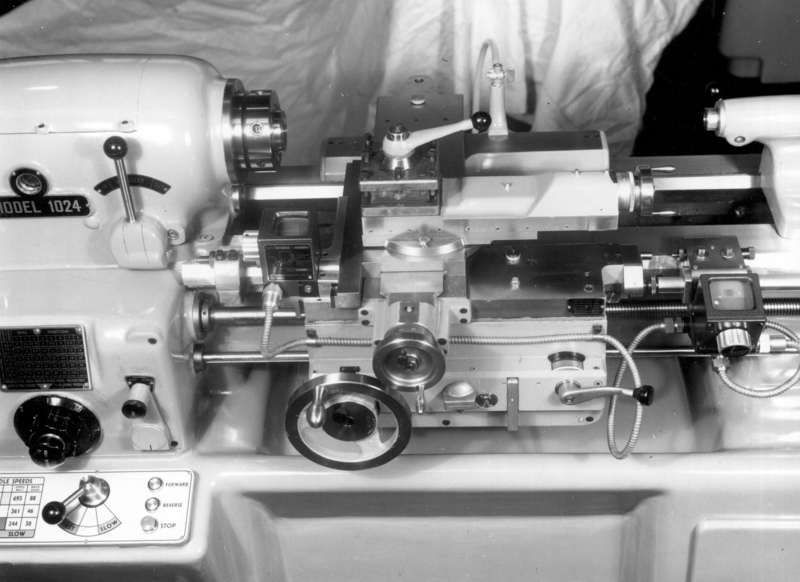 1 twelve spindle speeds were available, from 30 to 2500 rpm, with the headstock pulley running in its own ball journal bearings concentric with, but independently of, the main headstock spindle. A 3-speed, 3-phase motor rated 1/1.5/2 H.P. was located in the base and drove upwards to a 2-speed gearbox that incorporated a multi-disc friction clutch to smooth out speed changes. The speed-change gearbox was operated by a lever and the settings could be altered without having to move a belt from pulley to pulley. With a Type D1-4" nose and running in SKF type N.N.30.K double-row cylindrical roller bearings the heat-treated spindle was bored 11/4" and accepted collets up to 1" in capacity. Filtered oil was pumped automatically to the headstock, speed-change and screwcutting gearboxes while the apron was lubricated by a small pump contained within its base that was activated by the sliding action of the carriage assembly. Constructed from a high-grade nickel iron and flame hardened, the lathe bed was provided with what the designers considered the best combination of V and flat surfaces to locate and maintain the relative positions the headstock, carriage and tailstock over a very long service life. To help rigidity and vibration absorption the lathe was mounted on a cast-iron base of great weight. Produced as the "1024 VSL" the Mk. 2 version, whilst having the same capacity and being mechanically almost identical to the Mk. 1 (although cosmetically altered to make it look "modern") was fitted with a very effective push-button-controlled variable-speed drive unit that gave both forward and reverse speeds from 40 to 2500 rpm from a 3-phase, 3 hp (2.25 kW) motor. 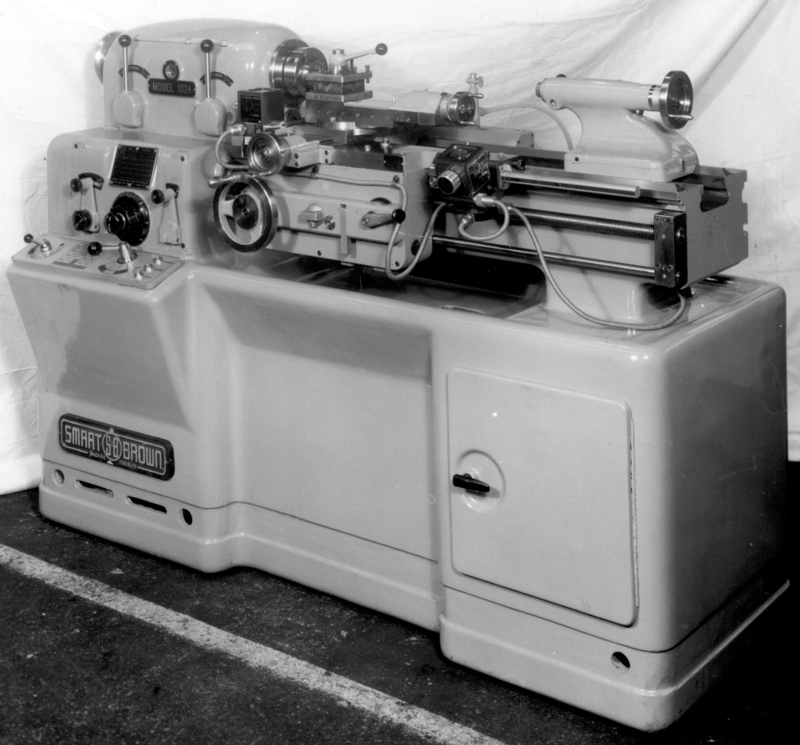 Dual metric/English micrometer dials and a coolant system were fitted as standard and the automatic lubrication of the leadscrew, saddle, apron and headstock was fitted to all years of production..
Smart & Brown Model 1024 Super-precision lathe speed controls. On the almost horizontal surface the lever to the far left controlled the 3-speed motor and that to the right the mechanical two-speed gearbox. The screwcutting controls were mounted on the vertical surface. The lever to the left, in combination with the central dial, selected up to 40 changes of pitch whilst that to the right selected either the power shaft, for sliding and surfacing feeds, or the leadscrew. 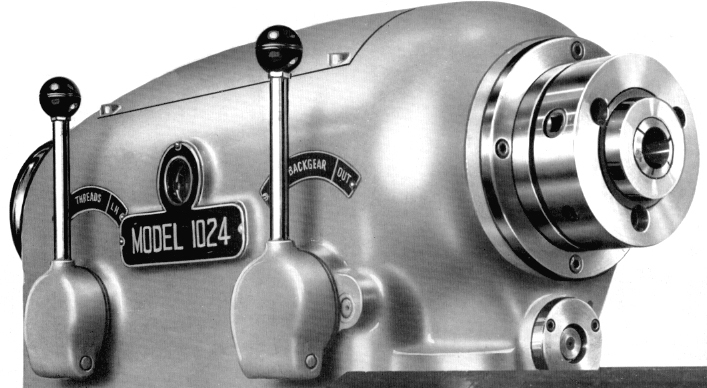 Smart & Brown Model 1024 Super-precision lathe headstock controls. The large lever to the left selected left or right-hand screwcutting whilst that nearer the spindle nose engaged and disengaged the helical backgears with a single movement - without the need to disengage pins or position other controls.